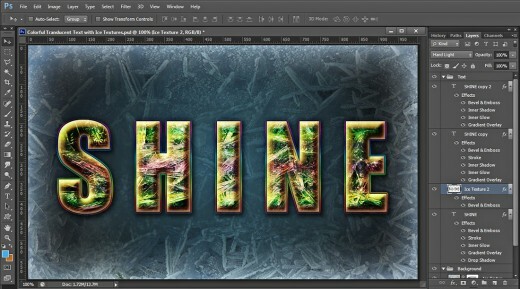 From this Photoshop tutorial you will learn how to create magical glowing Text Effect with two Ice Textures and Blending Options. In order to achieve the final result, we are going to use Impact Font (default), Layer Mask, Ice Textures which are my photos and unrestricted stock and a few layer styles which will enhance the colors and the emboss effect. 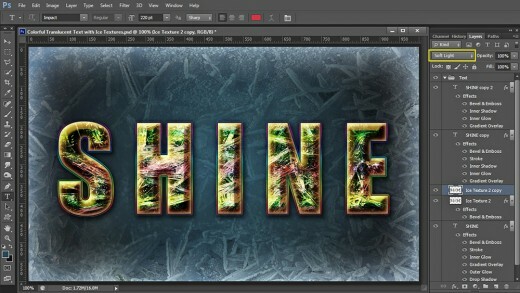 I have created my Text Effect in Adobe Photoshop CS6 but all other versions, even Photoshop Elements are applicable. 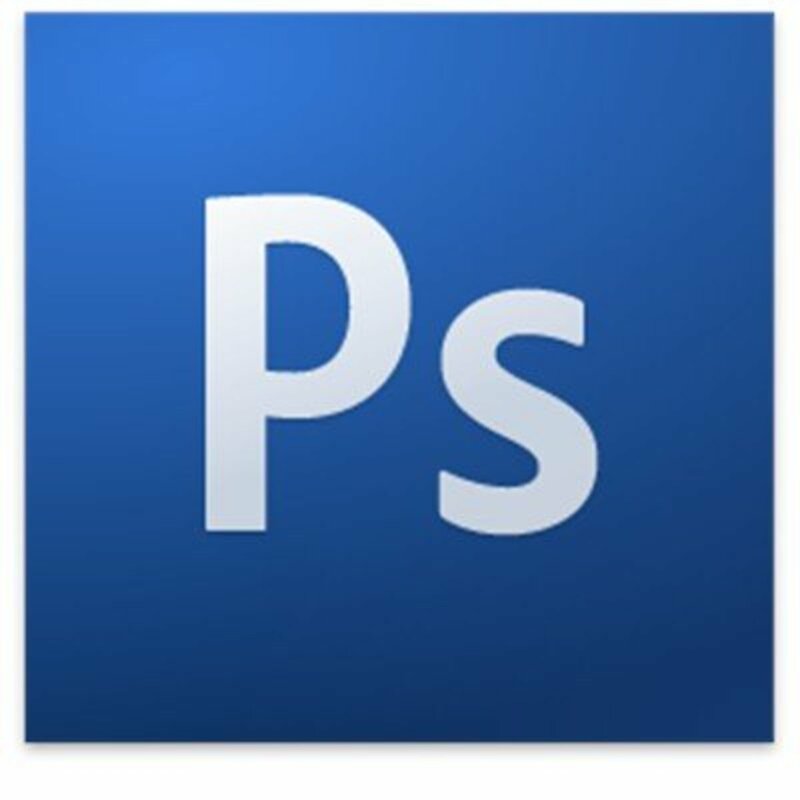 Create a New Adobe Photoshop .psd file of 1000px Width and 600px Height. Name the file Translucent Text for example. Insert 72 or 96 Pixels/Inch for Resolution as our Text is for online use. 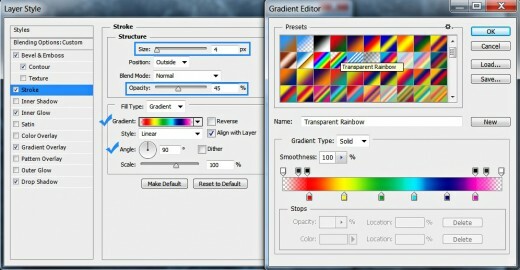 From Color Mode drop down menu select RGB Color and choose Transparent for Background Contents. 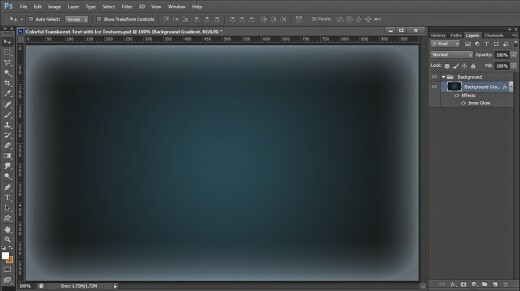 After you press OK button, transparent Layer 1 will be created in your Layers panel. 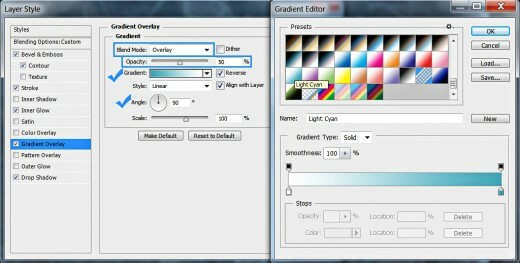 Change its name to Background Gradient then press Ctrl+G (Layer, Group Layers) to put the layer in a Group. Rename this new Group 1 to Background. If you should print your final result, set the Resolution to 300 Pixels/Inch and choose CMYK Color for Color Mode. 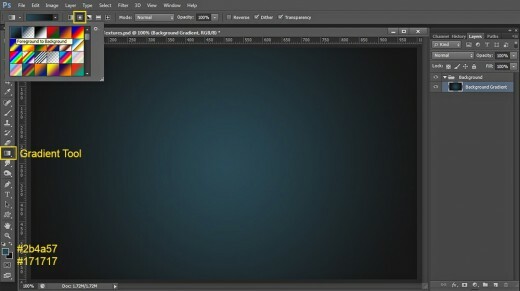 In Steps 2-7 you should colorize your Background with Radial Gradient then add light blue Inner Glow Layer Style to make the borders of the canvas look glossy. After the Background Gradient layer is ready, you have to paste the first Ice Texture in your document, resize it and change its Blend Mode, then apply Layer Mask and make thinner some portions of the Texture using Spatter Brush. Now we are going to fill our first layer with cool radial type of Gradient. For the purpose Set Forgeround Color to #2b4a57 and Background Color to #171717. Press OK button to close Layer Style dialog box. Our first Background layer is ready. In the next step we are going to texturize it. 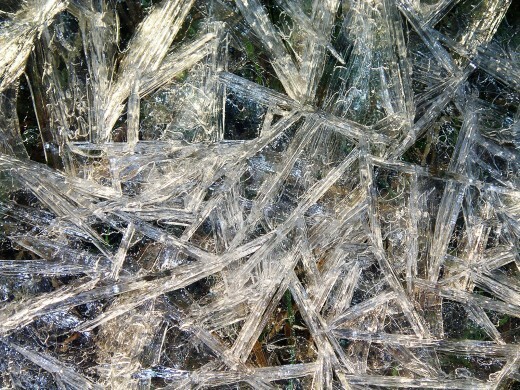 Now you should download this lovely Ice Texture. Click on it to open it in high resolution. When it opens in a new window right click on it and select Save Image As. Place it in your folder. We are going to use it in the next step. 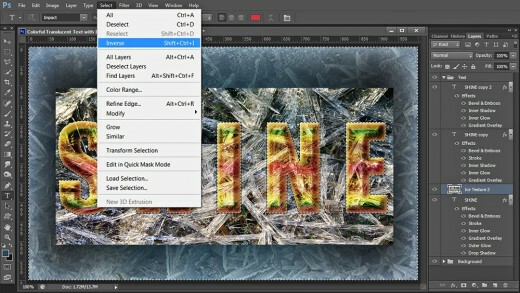 Create a New Layer on top of Background Group and name it Ice Texture 1. 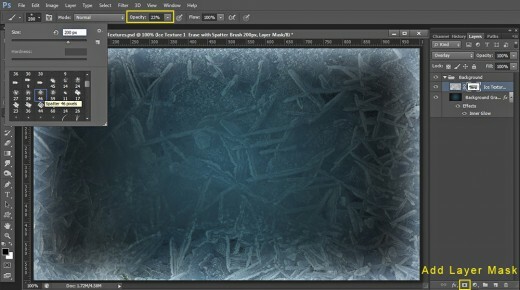 Open the Ice Texture in Photoshop and click Ctrl+A to select it, then Copy (Ctrl+C) and Paste (Ctrl+V) or use Move Tool to place the Texture in this new layer. In order to resize the Texture, which is bigger than your canvas, apply Edit, Free Transform. 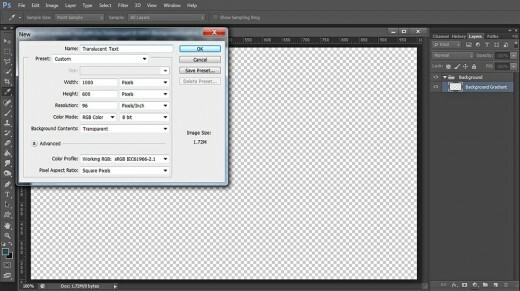 Resize it to cover your canvas then press Enter key to apply the Transformation. Change Blend Mode of Ice Texture 1 layer to Overlay. In Steps 8-14 you have to type the Text using thick default Font then add Shadow, Light Cyan Gradient, Rainbow Stroke, 3D Effect and Cyan Glow. This will be the work on your first Text layer. Later you should make two duplicates and process them too. Now select the Background Group. Press the hot key T or simply grab Horizontal Type Tool. 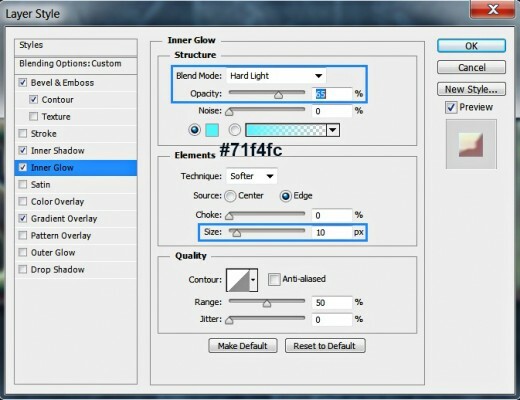 When the tool is active, navigate to the Options bar and choose Impact Font from the Font Family drop down menu. Set the Font Size to 220pt and choose #cd3846 for Font Color. Type Shine or any other five letter word in Capital Letters. When you are ready, highlight the Text and click on Toggle the Character and Paragraph Panels icon in your Options bar. Set the Tracking for the Selected Characters to 150. With Shine Text layer selected, press Ctrl+G and rename the new Group to Text. 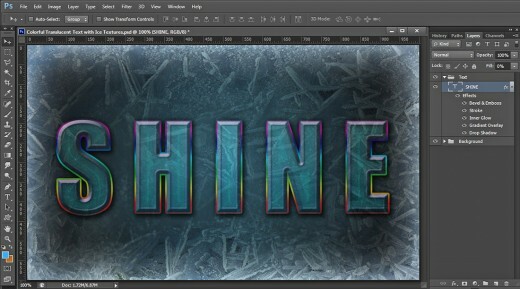 Now firstly reduce Fill Opacity of Shine Text layer to 0%. 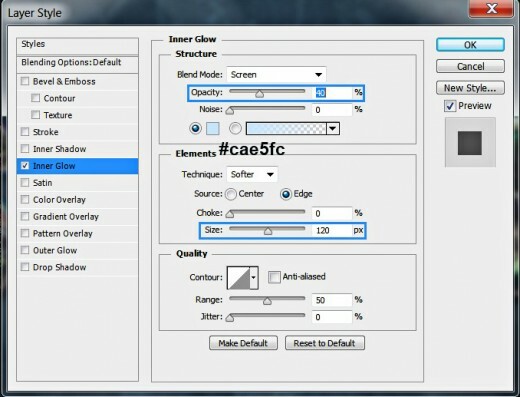 The Text will disappear but it will get back to visibility right now when we start to add Blending Options. Layer Knocks Out Drop Shadow: checked. 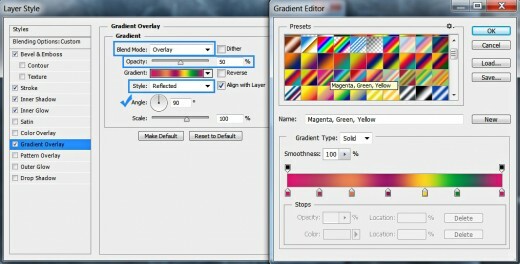 Keep Layer Style dialog box opened as we are going to add another six Blending Options in the coming steps. Press OK button to close Layer Style box. 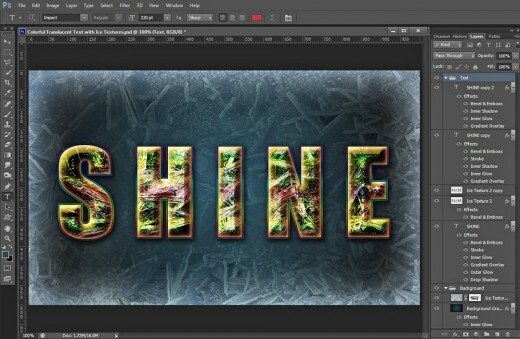 On the following screenshot is shown how your Text will look after adding the previous six Blending Options to Shine Text layer. 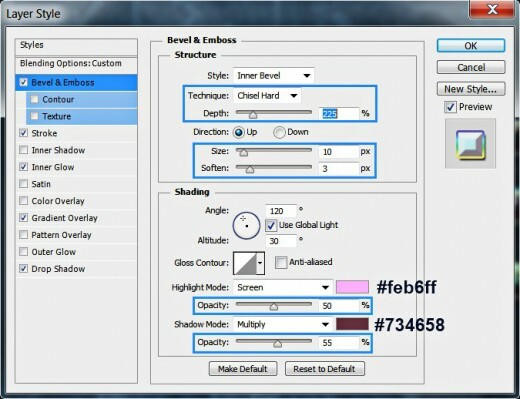 Lower the Fill Opacity of the layer to 0% because our task is to create translucent Text Effect. In Steps 15-20 we’ll continue with the hard and precise work on the Text. 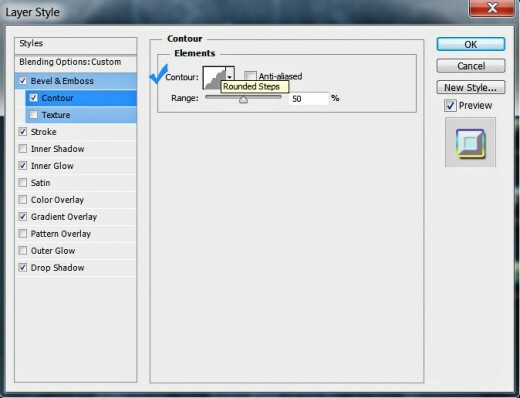 Firstly you have to create two copies of the original Text layer and remove the previously added Blending Options. Secondly, you should add beautiful default Gradient, orange Glow, Shadow, thin Black Stroke and Bevel & Emboss of vivid colors to the first copied Text layer. 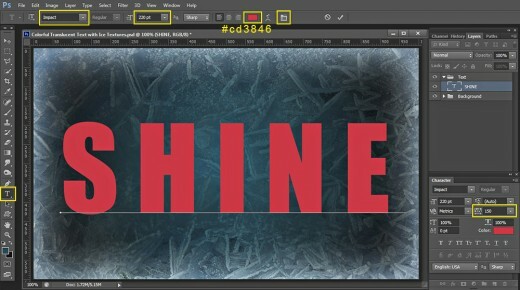 While Shine Text layer is still selected, press Ctrl+J twice (Layer, Duplicate Layer) to make two copies of it. 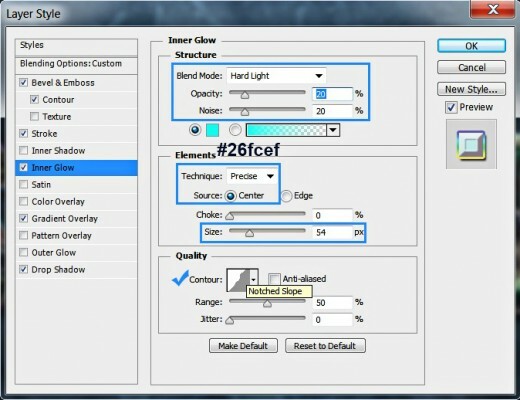 Keep Fill Opacity of Shine copy and Shine copy 2 layer to 0%. 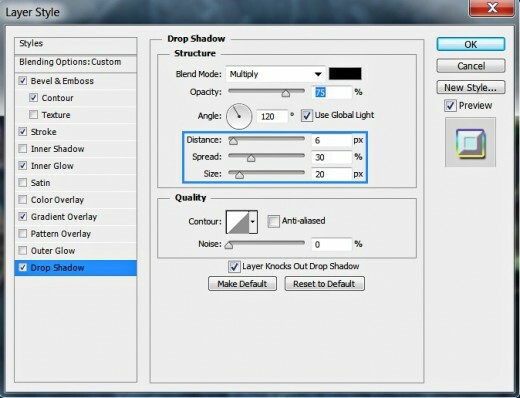 As we going to add new Blending Options to both copied layers, we need to get rid of the previously applied ones. 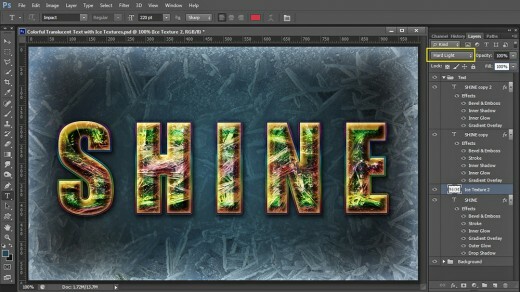 Right click firstly on Shine copy layer and select Clear Layer Style. Repeat the same on Shine copy 2 layer. Press OK button to close Layer Style dialog box. We finished our work in Shine copy layer. In Steps 21-25 you should highlight Shine copy 2 layer and start applying Blending Options on it to add colors and create 3D look. You have to apply vivid Reflected Gradient, cyan Glow, golden Shadow and Bevel & Emboss plus Half Round Contour. With this your main work on the Text will be completed. 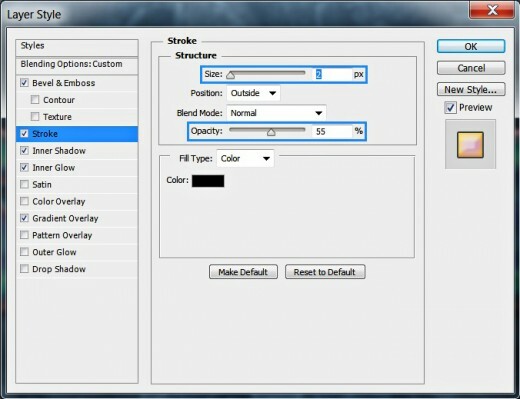 Keep Layer Style dialog box activated as we have to add another four Blending Options. 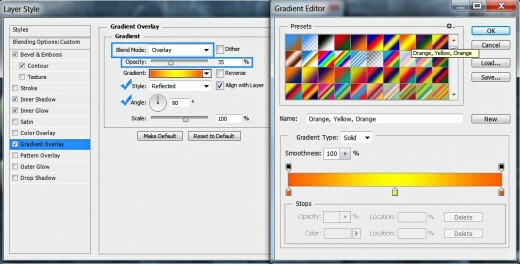 Now press OK button to apply the Blending Options and to close the dialog box. 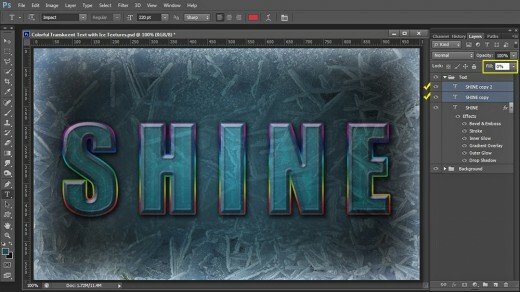 From the next step until the end of the tutorial your task is to turn your Text into an icy masterpiece. 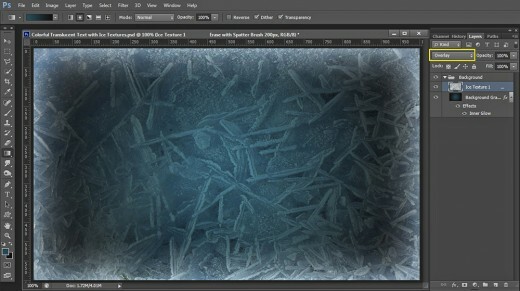 For the purpose you have to move the second Ice Texture into your .psd file and resize it. After that you should Load Selection on your Text, invert it and delete the excess parts of the Texture. You also have to change the Blend Mode of the Texture to make it translucent and add subtle 3D Effect. 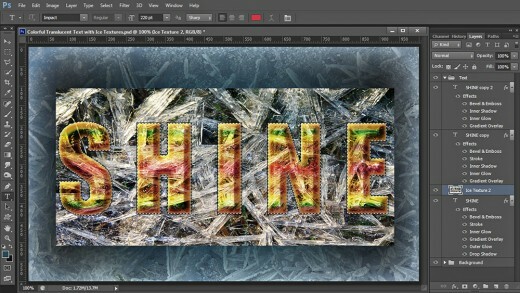 Your last step is to duplicate the Ice Texture layer and play with the Blend Mode to enhance the contrast. 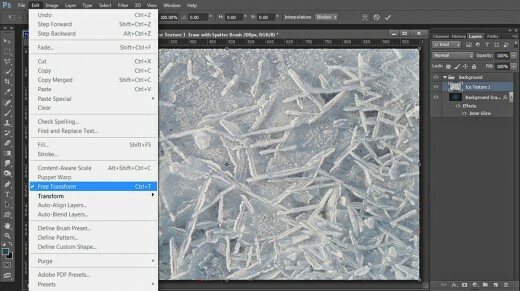 Create a New Layer and call it Ice Texture 2. Place it between Shine and Shine copy layer (see the next step). 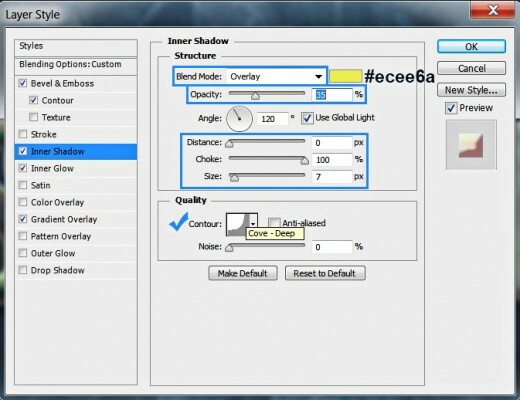 Copy and Paste in this layer the Ice Texture given below. 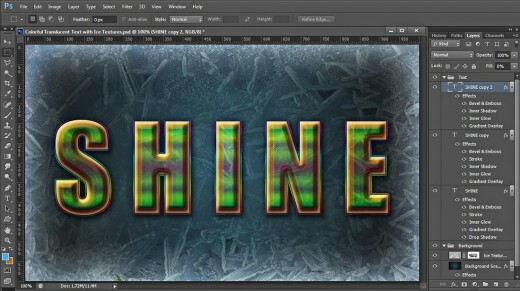 Go to Edit, Free Transform to resize Ice Texture 2 – it should slightly excess the borders of the Text. Press Enter key to apply the Transformation when you are ready. 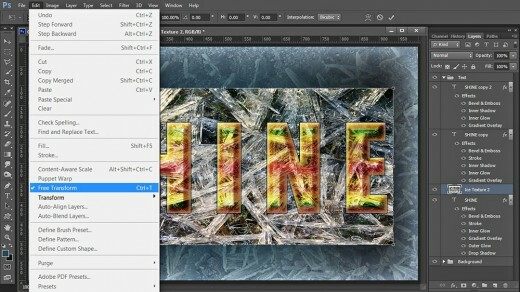 Now hold down Ctrl key and click on the Shine Text layer's thumbnail to Load Selection. Keep Ice Texture 2 layer selected. Navigate to the Menu bar and choose Select, Inverse (hot keys Shift+Ctrl+I) to invert the previously loaded Selection. Change Blend Mode of Ice Texture 2 layer to Hard Light. 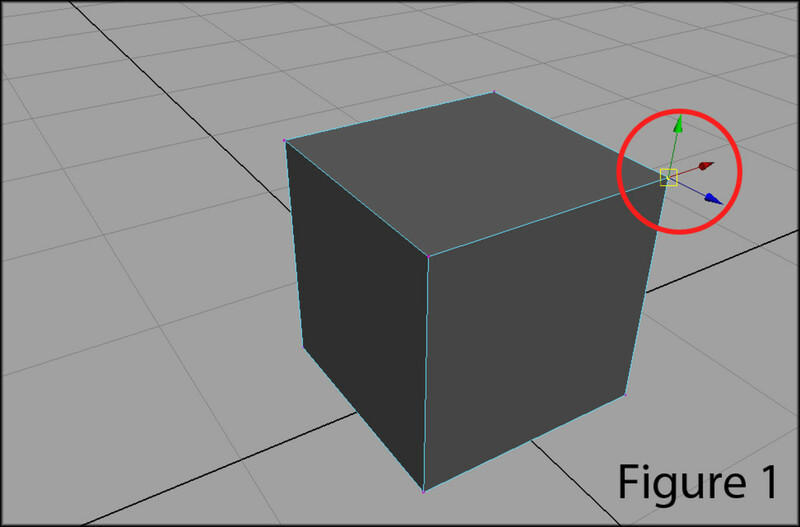 Press OK button to apply the 3D effect and to close the dialog box. Press Ctrl+J to duplicate Ice Texture 2 layer. Change Blend mode of Ice Texture 2 copy layer to Soft Light. 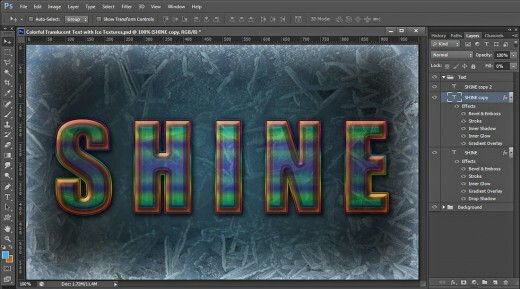 Remove the Bevel and Emboss Layer Style which was transferred from the original Ice Texture layer. 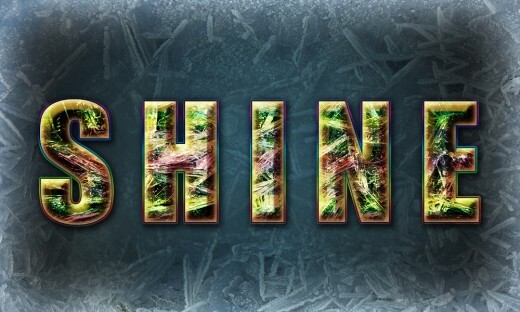 Text Group which consists of five layers: Shine, Ice Texture 2, Ice Texture 2 copy, Shine copy and Shine copy 2 layer. This is the ready Text Effect saved in .jpg format. 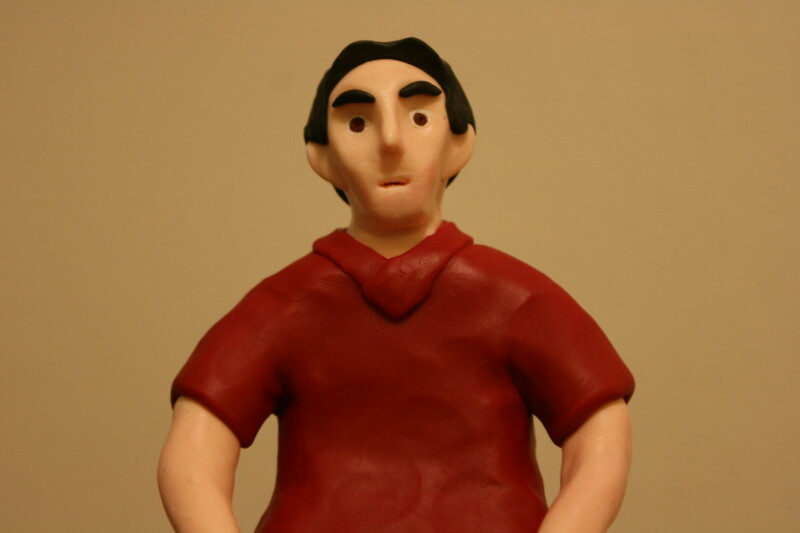 In order to get a better result I applied Filter, Sharpen, Unsharp Mask to the .jpg file. Hi Korneliya Yonkova. What a blessing are you to all of us with your creativity, especially to those who have ability to apply your creation. As for me, I am rejoicing and giving glory to the source of all wisdom. I love it. 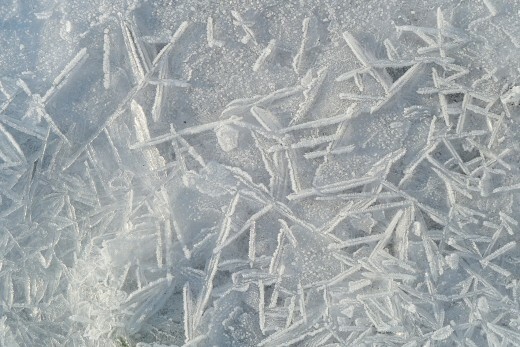 The ice texture is very cool. Nicely done, once again! Hi Korneliya, Another amazing text. I could never do what you do, but I love looking at it. Thanks for sharing.